Originally used as a promotional item in the 1990's and now back on our website in new molds we have the Stalinov pencil topper. We offer the topper in resin or in white metal (it was originally in white metal only) but please note the metal version is rather heavy for accurate use of a pencil. The topper is an altered version of the 28mm miniature KGB Liche Master Stalinov from 5002 with the base and lower coat removed and a recess for the writing implement (approx 24mm tall). Note that pencils come in a multitude of lengths and ends and thicknesses so you may have to alter the topper to make it fit. This is easy with the resin version. 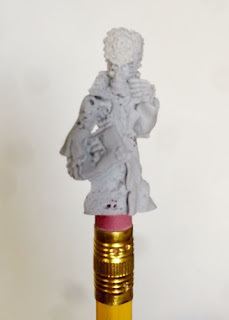 It can also be mounted on a suitable pen or if you prefer you could use the topper as a Dwarf Liche for your Undead formations in Flintloque and Slaughterloo.